When you are street racing with your friends or even the CPU, there is not a thrill quite like letting your tires make that screeching sound and be able to turn a corner without having to compromise your speed. Drifting adds to the layer of fun in every arcade racer and today we are discussing on how you might tackle The Crew 2 Drifting. The Crew 2 Drifting awards your XP. Consistency is important since a multiplier will then be applied to your overall drift score as long as you do not hit the surroundings and keep the drift going. There would be extra hurdles and obstacles in your way to keep the drifting game challenging. In such a case, you could benefit from keeping these points in mind when attempting to drift. The basic principles that go into how well you perform a drift are speed, angle, and how long you press the brake button. Of course, at high speeds, you would only need to apply brakes gently. While for tighter bends or corners at greater angles, the vehicle may need to be slowed down or brakes should be pressed longer. The most important thing about drifting in Crew 2 is avoiding obstacles while drifting. In order to get the most points out of the drift, you should prioritize avoiding obstacles and hindrances while drifting rather than drifting for long and hitting all the obstacles on the road. You could drift with the normal break button, the same one that allows your car to go into reverse. Once you approach a bend in the road, tap the button quickly (do not hold it!) and then use your analog stick to provide enough spin in the opposite direction so to counter the effects of the brakes. Alternate between right and left directions on the left analog stick to keep the drift going, but if you mess it up and spin out of control then pull your stick out of the turn to ensure you’re not the vehicle is not drifting or turning anymore. The more advanced and precise way of drifting would be to use the E-brake or the handbrake of the vehicle. This is not meant for beginners and will take some practice and get used to. Again, you only need to tap the button and not hold it so it does not spin out of control. You will also find that some of the cars are perfectly tuned for chaining drifts from left to right. Meaning when you are drifting to the left and the next turn is to the right, then these cars are best suited to make these turns with ending the drift, essentially chaining the next turn into the drift. These are the Drift Class cars. Another way of chaining the turns into your drift is, when your car is drifting around a turn and you see another sharp turn, bending the other way, just handle your car to bring it to the middle of the road and instantly use the nitrous to speed up in order to turn the other way, still drifting. This way, you will be able to make turns while still drifting, increasing your drift time and hence the XP gained from it. Try to stay close to the corners or the edges for maximum effectiveness. This will give you a better angle to carry out your drifts no matter how tight the bends are. A good place for you to practice your drifting would be the LA Airport in the game. Here you will find many bends around the grass hedges and a roundabout that severs as good spots for drifting. Additionally, you will also have a lot of open fields here to practice how the car responds to your controls. For a better experience, if you are really willing, you can go for a steering wheel. You can also manually tweak or alter settings that will change the sensitivity of handling and thus affect drifting. Other than this, you can even upgrade and modify any car of your liking to make it suitable for drifting. You can improve their handling to make it easier to handle them while drifting or improve their brakes to make the drift smoother. Practicing with your chosen car as often as possible. This is the only thing that will allow you to Drift Like a Tester. 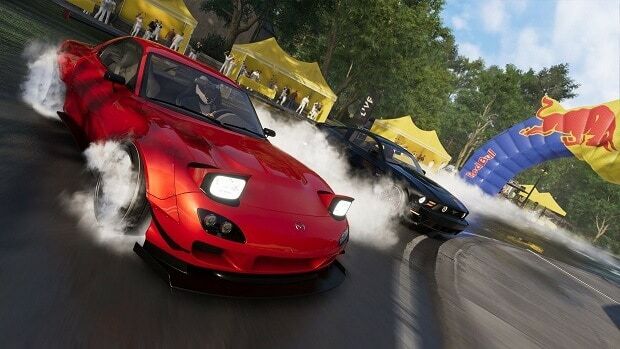 After having mastered the skill of drifting, you can move on to win trophies and unlock achievements associated with it. One such achievement is Drift Like a Tester. The event takes place in the Airport Terminal D. here you will be able to unlock this achievement and more. This is all we have in our The Crew 2 Drifting Guide. If there is anything else that you would like to add, let us know in the comments section below!